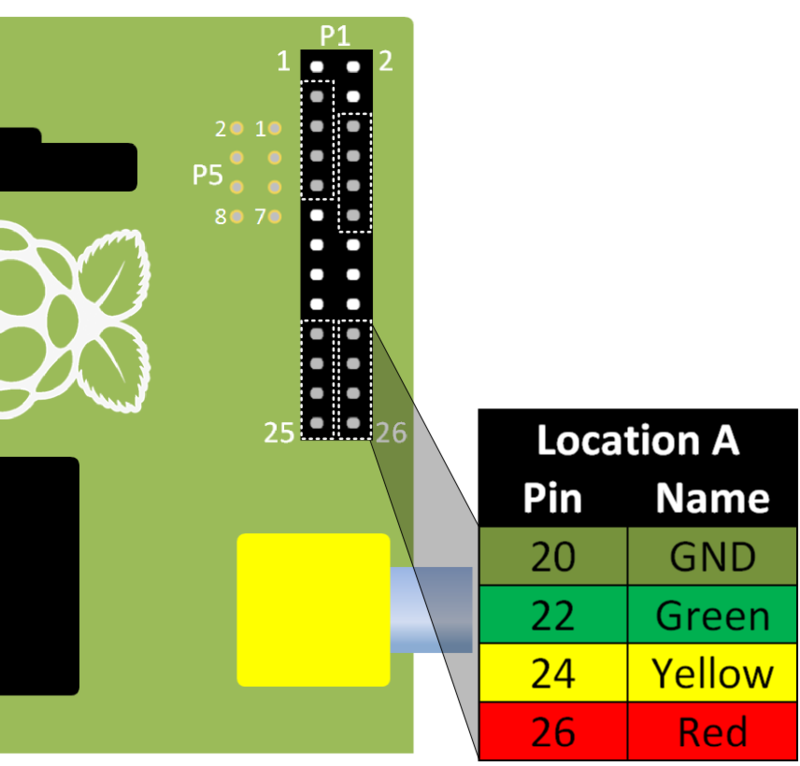 In this guide we will use the Pi-Stop to test our memories. In 1956 a very famous psychologist (someone who studies how we think) called George Miller stated that on average most people will be able to remember up to seven items (plus or minus two). I wonder if we can prove if Miller’s “Magic Number Seven” is true or not? We can write a game which will test this hypothesis (the theory/idea) by challenging our friends. Who will have the best memory at the workshop? The following game is similar to a well known game from the 1980’s which creates an ever increasing sequence of lights which the player has to repeat by pressing the lights in turn. 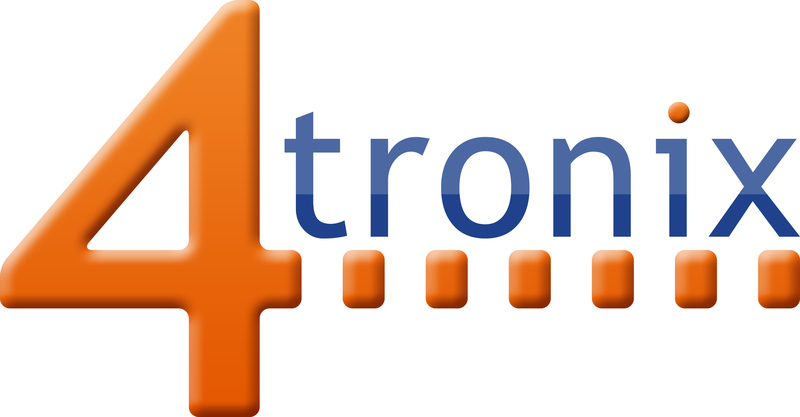 We will create our own version using the three lights of the Pi-Stop and the keys “1”, “2” and “3” on the keyboard. We ensure that everything is ready when we start a new game. 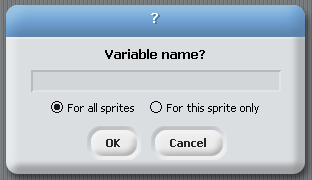 Select the Variables tab and add a new variable by pressing the “Make a variable” button, call it Score and set it to be For all sprites. NOTE: Remember the tick next to it controls if it is displayed on in the main Scratch window. For this game, being able to see the numbers in the GameList would allow you to cheat, so it is worth hiding it when you are playing it properly (I suggest you leave it visible for now so you can see the game working). Switch OFF all the lights – We can use an ALLOFF broadcast group as we have done in previous guides. We reset the Score to 0. NOTE: All the remaining parts of the game will now go inside the forever block, so the game will continue until we stop it. 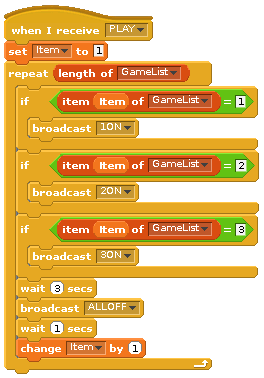 Within the forever loop in the main set of blocks, we can now add a new item to the GameList (a random number between 1 and 3) and run a new broadcast group block called PLAY. NOTE: You will also need another variable called Item – this allows us to keep track of where we are within the list. Ensure you add this by creating it in the Variables tab. 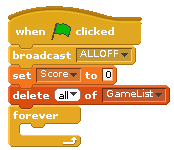 You can now test the program by clicking on the Green Flag and see what the program does. We should have an ever growing repeating sequence of light patterns! 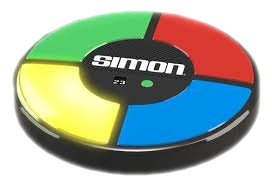 WORKSHEET: Tick the checkbox marked “The first part of the Pi-Stop Simon Memory Game works!”. The player will need to press the correct keys in order to see if they can match the GameList, we will store the player’s choices in a new List called PlayerList. Tell the player to “Repeat the sequence” and ensure the PlayerList has been cleared. 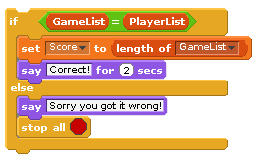 Allow the player to enter their own sequence by detecting each key press “1”, “2” and “3” and add them to the PlayerList. 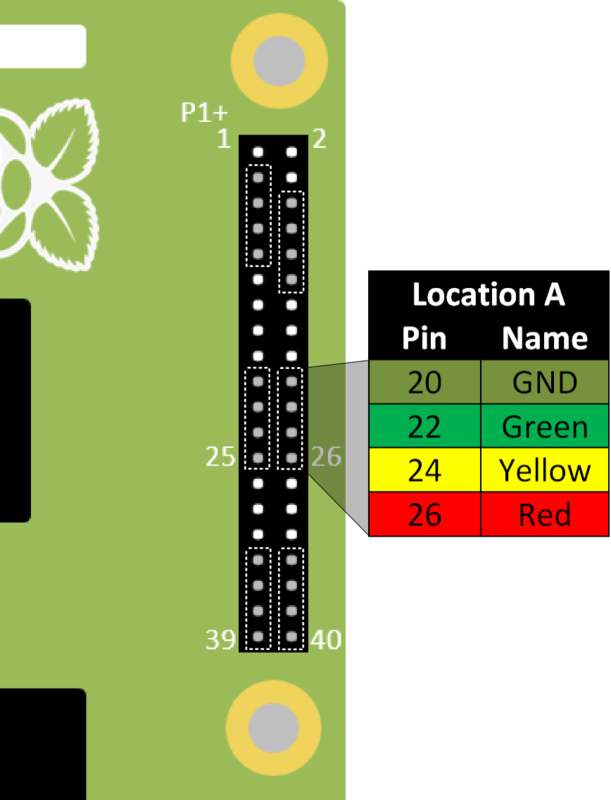 We will also light up the corresponding LED to show the sequence on the Pi-Stop. If the GameList is the same as the recorded PlayerList we can update the Score and continue (which will add another random light for the player to remember). If the GameList is different then we will stop the script, the player made a mistake and the game has ended! 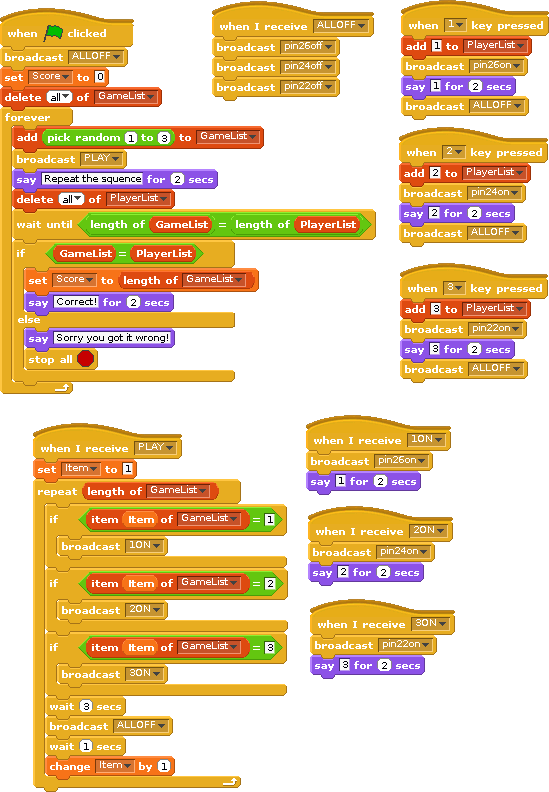 You finished program should look something like the following. WORKSHEET: Tick the checkbox marked “I’ve created the Pi-Stop Simon Memory Game”.